The UMWA is one of the oldest and traditionally most militant unions in American history. 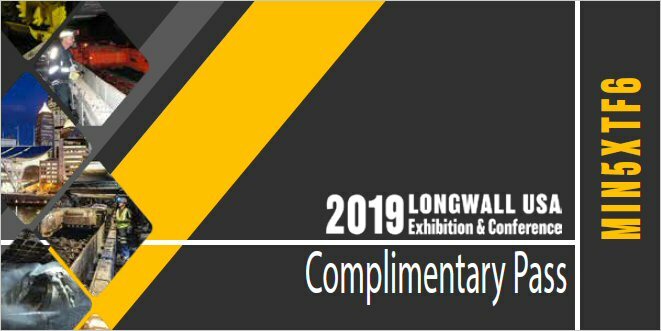 Founded in Columbus, Ohio, in 1890, the UMWA is celebrating its 125-year anniversary this year, but there will be no active UMWA coal miners celebrating in the ILB. With the Highland mine closure, the UMWA will cease to represent labor at any active coal mine in the ILB, which includes Illinois, Indiana and western Kentucky. Since its inception, it has engaged in bitter disputes with bituminous and anthra-cite coal mine operators for safe working conditions, fair pay and other benefits. When the union was founded and for many years thereafter, these were legitimate issues. During the first half of the 20th century, it was the most powerful union in the U.S. During this period, the union frequently met success, thanks to the leadership of John L. Lewis and the policies of the New Deal Coalition of President Roosevelt. Under his reign, national membership grew to as many as 800,000 during the 1930s. Lewis was a persuasive labor organizer, leading the UMWA from 1920 to 1960. Capitalizing on the pro-labor mentality under the New Deal, Lewis successfully organized the Appalachian coalfields (as well as the ILB) in the early 1930s. As a result of his successful organizing campaign, the UMWA formed the pillar of Franklin D. Roosevelt’s labor support in the 1936 presidential election. After World War II, the UMWA focused on mine safety and achieving large increases in wages, medical services and retirement benefits for its shrinking membership. Lewis retired in 1960. After his retirement, the union experienced unbalanced and unpredictable leadership until Richard Trumka was elected president of the UMWA in 1982. He restored a degree of order and democracy. Under Trumka and his successors, the union has been more focused. But, by 2014, membership dwindled to 60,000 in the U.S., of which only 20,000 were active coal miners. Coal production in the ILB peaked during World Wars I and II, then again from 1970 to around 1990, and is peaking again now (see Figure 1). The first two declines in production occurred during the Great Depression and when the railroads switched from coal to diesel in the 1950s. The implementation of the Clean Air Act of 1970 caused ILB production to remain stagnant from 1970 to 1990 as many utilities decided to switch to western U.S. coals to meet the sulfur emissions limits imposed on coal-fired power plants. The implementation of the Clean Air Act Amendments (CAAA) of 1990 forced many more utilities in the Midwestern and Upper Tier states to switch from Western and Central Appalachian coals, causing ILB production to drop by 40 million tons from 1990 to 2000. The growth in demand since 2000 is due to the even tighter emissions rules, which have forced utilities to scrub all plants. They can now burn higher sulfur coal, which has a high calorific value (more Btu’s per lb) and low transportation costs; ILB coal operators are regaining the regional markets it had lost. Job security was the main issue during the 1978-1979 strike. The epidemic of wildcat strikes that occurred during 1981 and 1982 severely affected union membership and revenues as miners felt the union’s collective bargaining power and clout at the work site had not been restored. 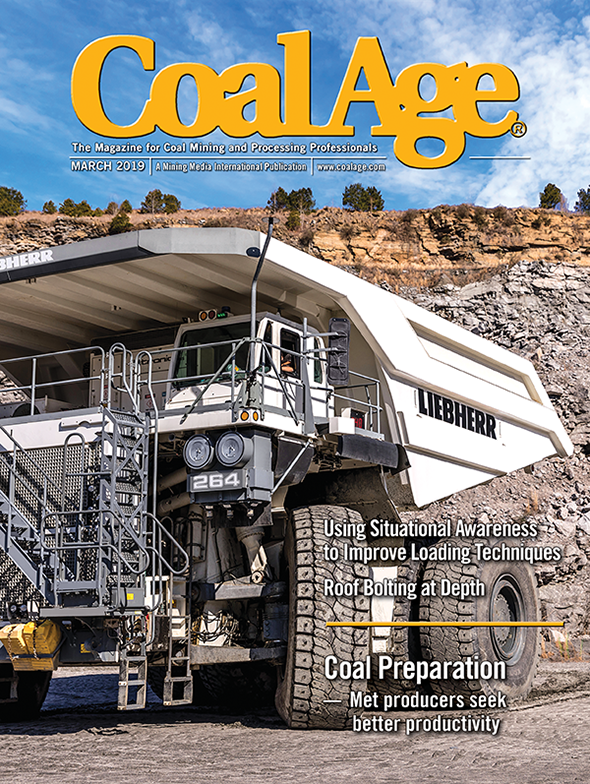 In 1984, Massey refused to sign the Bituminous Coal Operators Association (BCOA) agreement, which historically set the standard for wages and benefits throughout the industry. This action caused major production setbacks not only at Massey mines, but at all UMWA-organized mines east of the Mississippi River. In 1993, the UMWA called a prolonged strike to protest the opening of non-union mines. It had hoped to regain members and influence. Considered an unsuccessful strike against the BCOA, it further weakened the image of the UMWA. During the 1970s, UMWA production accounted for approximately 95% of total ILB production, but has since dropped as non-union production flourished. Non-union production received its first boost in the late 1970s when the big eight producers (Peabody, Arch, CONSOL, AMAX, Freeman United, Island Creek, Pittsburg & Midway and Old Ben) received long-term contracts to supply new coal-fired power plants with a guaranteed coal supply. To comply, most of these companies dropped their small accounts (mainly small utilities and industrial coal consumers). This in turn allowed the non-union companies to open mines to supply the void left by the big companies. Undependable production, low productivity and the high costs associated with UMWA mines are the primary reasons UMWA production has dropped over the years. For instance, production statistics filed with the Illinois Coal Association revealed that in the 12 months ending March 31, 1979, a total of 573 eight-hour production shifts were idled at Illinois mines because of wildcat walkouts. This resulted in the loss of an estimated 1.3 million tons of production, but was not considered a strike. In another instance, after Freeman United opened its Crown III mine in 1981, the union shut it down in 1982 for three years. In 1987, they closed it again. After the union agreed to concessions, the company reopened Crown III in 1991. The strikes between 1970 and 1994 greatly impacted supply, which caused consumers to search for alternative options (Western coals). During each extended walkout, some Midwestern utilities were kept supplied from non-union mines in the ILB and western U.S. — a lesson not lost on some coal consumers for whom dependability of supply was critical. These events created substantial changes in the minds of coal producers as well. They also created a new mindset among the hourly workers, who could see the damage to paychecks caused by extended union disruptions. I have first-hand experience with UMWA antics, having witnessed, after the 1981 strike, Lowry Blackburn, then-president of AMAX Coal Co., stating in an internal meeting that AMAX would not build any new mines in the ILB, and that the company would only serve the existing long-term contracts and subsequently exit the ILB. Some of the disruptive incidents I saw were the numerous walkouts at the Delta mine in southern Illinois. One especially comes to mind. It was a hot 100°F day in July 1990. There was no drinking water in the pit so one of the non-union foreman (a mining engineer) picked up a large water jug, drove it to the pit and dropped it off. The union members were outraged. “That’s a union job!” they cried. So they walked off the job for three days. Since the mine was not making money, AMAX (Cyprus Amax at the time) was bought out of its contract with CIPS’s Newton power plant for approximately $70 million. The mine was permanently closed in 1996. The plant switched to Western coal. I also have a Wabash mine experience. The Wabash mine was a 3.5-4 million tons per year (tpy) continuous mining operation in southeastern Illinois. All (100%) of its production was sold under an above-market contract to supply PSI’s Gibson power plant in Indiana. This mine alone made AMAX $40 million per year. The contract price was approximately $40/ton and the cost of production was roughly $30/ton. The Wabash mine, however, had the lowest productivity in Illinois — typically ranging from 2.5 to 3 tpmh compared to the average of around 3.5 tpmh. Costs at other mines were at least $5/ton lower and many were $10/ton lower. The spot price at the time was around $25/ton. Perhaps the low productivity was due to many of the miners sleeping during third shift, as seen by my friend, who was the third shift non-union foreman. I also recall AMAX Coal management caving by giving into various union demands as the company could not afford to have the mine go on strike. Corporate needed the revenue to pay off its huge debt to the banks. The union knew this and took advantage of the situation. The bottom line is that Lowry Blackburn’s 1982 prediction came true, AMAX’s last mine, the Wabash mine, which was owned by Foundation Coal at the time, closed in 2004. Nearly all other companies met the same fate, but not all. While most of the companies with UMWA-organized mines eventually closed, only Peabody Energy and Arch Coal have continued to have a presence in the ILB. Peabody’s vast ILB coal reserves allowed it to go non-union through strategic acquisitions of small non-union producers (namely Black Beauty, Arclar, Dodge Hill and Lexington), using them to develop its abundant reserves. Peabody also allowed Armstrong Energy to acquire its West Kentucky reserves in Ohio and Muhlenberg counties. Peabody spun off its remaining UMWA mines and liabilities into Patriot Coal in 2007, effectively allowing Peabody to become 100% non-union in the ILB. Arch exited the ILB in 1998 with the closure of its Captain mine as Phase I of the CAAA was implemented. It returned to the ILB by forming a strategic relationship with Knight Hawk Coal in Illinois, and now controls 49% of the non-union 4.5- to 5-million-tpy company. 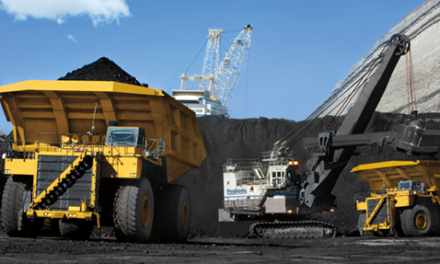 Through its ICG acquisition, Arch Coal now controls the non-union Viper mine in Illinois. During 2011, UMWA mines only accounted for about 4% of total ILB production; however, the UMWA scored a victory in 2012 when it successfully organized the Peabody’s Willow Lake underground mine in southeastern Illinois. It was anticipated that Peabody would shut down the mine, and sure enough, they did at the end of 2012, citing market conditions and high costs. The mine was also the least productive deep mine in the ILB that year. Not only did the undependable production cause the UMWA to lose market share over the years, low productivity and the work ethic of its members also had a negative impact. Where the “future belongs to the low-cost producer,” the UMWA eventually worked themselves out of the market. The mines simply could not survive in a cost-competitive environment. 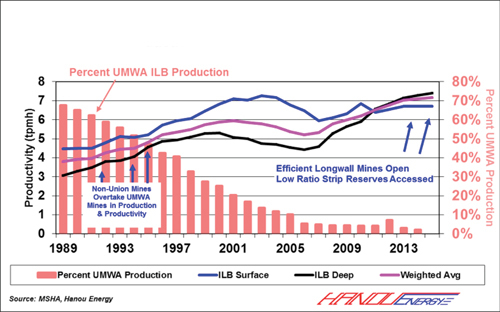 From 1989 to 2000, overall weighted average ILB mine productivity improved by more than 50%, which corresponds with the annual loss of UMWA market share. The period of productivity stagnation during the early 2000s is due to lack of production growth in the ILB, the depletion of permitted surface and deep reserves and the implementation of the Mine Improvement and New Emergency Response Act of 2006 (The MINER Act). 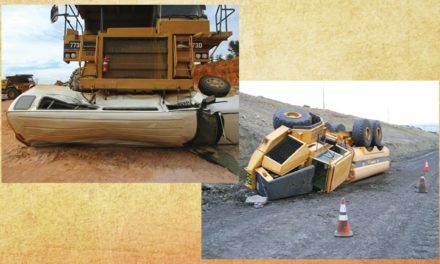 The act forced deep mines to improve safety measures, particularly with mine seals, which caused mine productivity and production to drop as existing mines complied with the new law. The growth of productivity after 2007 is mainly due to Foresight Energy opening the most efficient longwalls in the U.S., arguably the world (Pond Creek, Sugar Camp and Deer Run), the openings of Alliance’s River View and Sunrise’s Carlisle mines, and the opening of low-ratio surface reserves in west Kentucky by Armstrong and Illinois by Knight Hawk. In 1989, the UMWA accounted for 78% of ILB production. By 2001, UMWA production only accounted for 28% of the ILB production. By 2013, UMWA production only accounted for 3% of total ILB production. With the closure of Springfield’s Crown III mine in 2012 and the closure of Patriot’s Highland No. 9 mine in 2014, production from UMWA-organized mines will cease to exist in 2015. 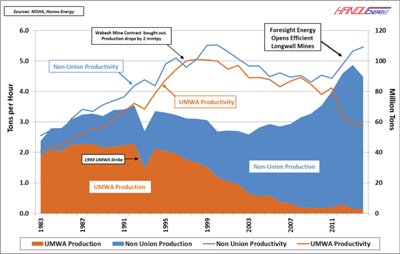 With the exception of one year (see Figure 4), overall, UMWA miner productivity lagged non-union miner productivity for the entire period. (It should be noted that UMWA surface mine productivity also lagged non-union productivity.) It was only in 1997 that overall ILB UMWA productivity was higher than non-union productivity. This was mainly due to the Wabash mine dropping its production capacity by 2 million tpy as result of its contract to supply the PSI Gibson power plant being bought out by Black Beauty — a non-union operator. With a modified UMWA contract, Wabash mine productivity improved from 3 to 3.5 tpmh in 1997. With the least productive UMWA mine (Wabash) reducing production, it allowed overall UMWA miner productivity to increase in that particular year. But it was also a year where most other UMWA mines improved productivity due to strong demand and perhaps the UMWA miners thought their mines would also reduce production or shut down, so they worked harder. Unfortunately, the higher productivity was short lived. After 1997, UMWA productivity lagged non-union productivity each year thereafter. Starting in 2010-2011, non-union underground productivity increased dramatically as result of Foresight Energy opening its longwall mines. At the same time, UMWA productivity dropped substantially, effectively sealing the fate of the other mines in the region (Crown III and Highland No. 9). Formerly known as Peabody Coal Co.’s Camp mine complex and located in Union and Henderson counties of the western Kentucky coalfields, the UMWA-organized Patriot Highland No. 9 mine re-opened in the first quarter of 2003. During the first 10 years of production, the continuous miner operation successfully produced at a rate of approximately 900,000 tons, occasionally producing more than 1 million tons. Peak production occurred in 2008 when 3.9 million tons of clean coal were produced. Miner productivity was also relatively strong when compared to other continuous mining operations in the ILB, averaging 4.6 tpmh. The industry average was 4.7 tpmh. However, something happened shortly after Patriot and Highland were spun from Peabody in October 2007. Starting in 2008 and continuing into 2012, the mine’s productivity started to wane. 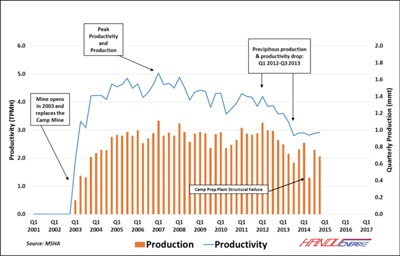 In the first quarter of 2012, miner productivity was a relatively healthy 4.1 tpmh when nearly 1 million tons were produced, but a big change was about to occur. By the third quarter of 2013, miner productivity dropped to a dismal 2.8 tpmh and production dropped to 610,000 tons. It is apparent the lower productivity corresponds with Patriot’s July 7, 2012, Chapter 11 bankruptcy filing. Reportedly, absenteeism soared as Highland workers became worried about their vacation time and sick leave, and therefore took time off. Morale waned throughout 2013 as UMWA leadership implemented a public relations campaign against the potential changes to pay and benefits resulting from the bankruptcy. Turnover was high, as many workers apparently fled to work at Alliance’s new River View mine, which was hiring at the time. Patriot held job fairs in east and west Kentucky during the fall of 2013 to help fill open positions at Highland. By the end of 2013, the combination of high absenteeism and loss of experienced labor and management caused productivity to decline by approximately 33%. Patriot emerged from bankruptcy on December 18, 2013. However, the combination in 2014 of low and stagnant productivity and falling market prices sealed the fate of the mine. It is common knowledge that the Highland complex was targeted to produce 4 million tpy, and was likely competitive at this volume. At a rate of 3 million tpy, the costs skyrocketed above management’s expectations and the market value of the coal. It is reported that production increased to targeted volumes after the 60-day notice was communicated on December 5, but by then, it was too late. With the mine’s closure, approximately 480 employees permanently lost their jobs. It is this author’s opinion that the greediness and sluggishness of the UMWA workforce, coupled with difficult work rules in the UMWA contracts that led to lower productivity and higher costs and the influence UMWA radicals at the mine level, were the real underlying cause of its demise. Finally, I send my sincere condolences to the family of Eli Eldridge — the last UMWA miner to lose his life in the ILB. He died in a haulage accident on December 16, 2014, just days before the Highland No. 9 mine’s permanent closure. John T. Hanou is president of Hanou Energy Consulting LLC, a consulting firm that assists coal producers, transportation companies, steel companies, power generators and investors in solving issues related to coal markets. He can be reached at (410) 279-3818 or by email at jthanou@hanouenergy.com.